Located in the soon-to-be AVA of Coombsville in southeastern Napa, the winery, which I'm guessing you have to see to believe, is something out of a James Bond movie. Built into the foot Mt. George, it is a testament to Dr. Palmaz's imagination, audacity, and what happens when you let a couple of visiting geologists think freely with your checkbook. 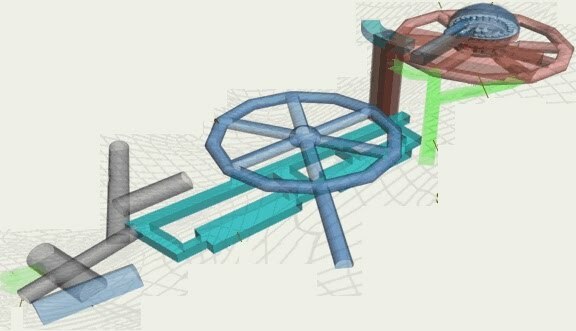 The follow the grape section of Palmaz's website explains how this gravity-fed facility is laid out and is worth checking out. Florencia Palmaz, head of Sales and Marketing, explained the impact this has on the end product. "Since the wine never sees a pump - and since we don't believe in micro-oxidation, the bottled wine has very low oxygen content. That translates to a wine that takes some time to evolve, but which also lends itself to longevity for those with the patience." So, that explains it! We decant almost every bottle we review to give it time to open up. This one certainly took its time (see notes below), but was worth the wait. But before we get to the wine, the Palmaz Vineyard is an interesting enough place to mention a few details. First, it's a family run joint - not just in terms of management or funding, but they are hands-on. All visitors to Palmaz are greeted by a family member. When was the last time a visitor to Napa saw the owners in the tasting room? And it's the family who handles much of the day-to-day operations of the winery. That means their attention to detail is exhaustive. It also translates to a loyal clientele. Very loyal. In a year that will likely go down as one of the worst since prohibition, their sales are up 73% thanks mostly to their direct sales. Disclosure: This wine was received as a press sample from the winery's PR firm. The price isn't unusual for Napa, but there is stiff global competition in and below this $ group - and at this price this should really be delivering (more). 3.5. Opened up nicely after a few hours. Plumps, round fruit nose. Hmmm, pleasantly surprised by how accessible this is. Did I mention the nose? Text book Napa flavor profile with a little something extra. 78% Cab with some other friends in the mix almost make this a Meritage or a Cab blend, but the addition of healthy dose of Merlot really smooth things out. Long finish with (almost chalky) mouth-coating tannins make it memorable. 4. After 8 hours open and on the table, this wine is coming alive in a big way. Commanding attention, but not in a "Hey, look at me!" kind of way, but in a quietly seductive way. The fruit evolves into expanding dimensions that make you want to sing. Wow. The 2007 is due out in October. In the meantime, find some of the 06, a corkscrew, and a decanter. And remember to open it early in the day to give it enough time to fully evolve. First of all, I am thrilled that you enjoyed the wines! Your description is quite accurate how I perceive the wine as well. We hope that our customers come to love the classic elegant style of Napa Cabernet that we enjoy to produce. 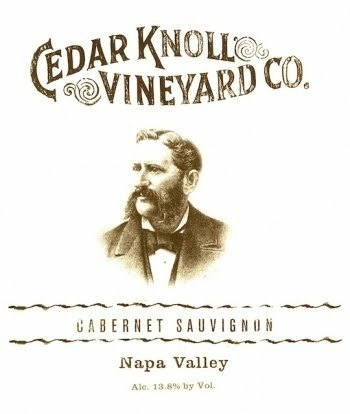 We have been working hard to resurrect the pre-prohibition winery and vineyard of Cedar Knoll. The 2006 vintage is a great reflection of the progress we have made in our vineyard. 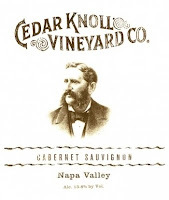 The brand image of Cedar Knoll is the original logo of our property from 1871 and the portrait is of its found Henry Hagen. Both the barrel brander and the portrait were found in our basement when we arrived. I hope that Henry Hagen is pleased with what he have done with his old place I know that we are. Finally I can not stress enough that all our effort is not realized unless you are patient to let this wine open up. It is the compromise we made for making collectable wines. I beg everyone, if they are going to drink any of our wines the year they are released, please decant. This is also a great wine to try out all those new decanting gizmos. Or just drink each glass slowly knowing that the next will be even better that the one before and enjoy the progression in the glass. But best of all loose a bottle or two in the back of the cellar and check back in a few years.